SWAMPSCOTT — Protesters camped outside Gov. 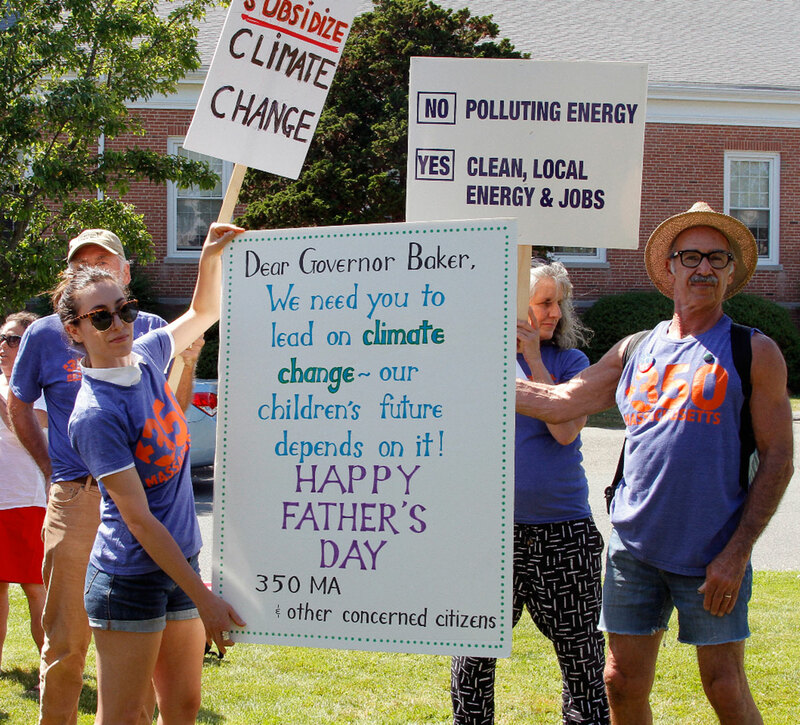 Charlie Baker’s home Sunday to demand that he protect youth with clean and safe energy. About 30 activists from organizations, including 350 Massachusetts for a Better Future and Neighbor to Neighbor, went to Baker’s Monument Avenue home with signs and megaphones. They wanted to present him with a Father’s Day card and ask that he support clean energy rather than gas pipelines and the taxes needed to build them. Prior to making their way to Swampscott, the activists also staged a rally outside House Speaker Robert DeLeo’s Winthrop home. Police directed the protesters away from Baker’s home to the gazebo park area down the road, where their permit for the event was valid. The groups held a public meeting at Lynn City Hall last month to express fear that the suspended $3.3 million Kinder Morgan pipeline, which would have run from New York through Lynnfield, West Peabody and Danvers to Dracut, would resume and threaten the city’s drinking water. The rally focused on Texas-based Spectra Energy Partners’ Access Northeast, and its plans to expand its pipeline in southern Massachusetts. Plans include a natural gas compressor station in Weymouth and a metering and regulation station in West Roxbury. While the project won’t reach the North Shore, activists urged Baker to oppose taxes that would appear on utility bills to finance construction of the pipeline expansion, Altemose said. “We’re calling on the governor not to go forward with the pipeline tax,” Altemose said. Attorney General Maura Healey has opposed the pipeline tariff and Baker hasn’t clearly stated if he thinks the tax is necessary, he added. Former Gloucester City Councilor Jay Gustaferro said the public shouldn’t pay for a pipeline to export gas from Pennsylvania to Massachusetts. Turner Bledsoe, co-founder of Fore River Residents Against the Compressor Station, said methane from fracking is driving climate change and is 100 times more powerful than carbon dioxide. “If we’re going to save this planet, we need to stop the expansion,” Bledsoe said. It was unclear whether Baker was home at the time. He did not come outside to talk with the protesters.